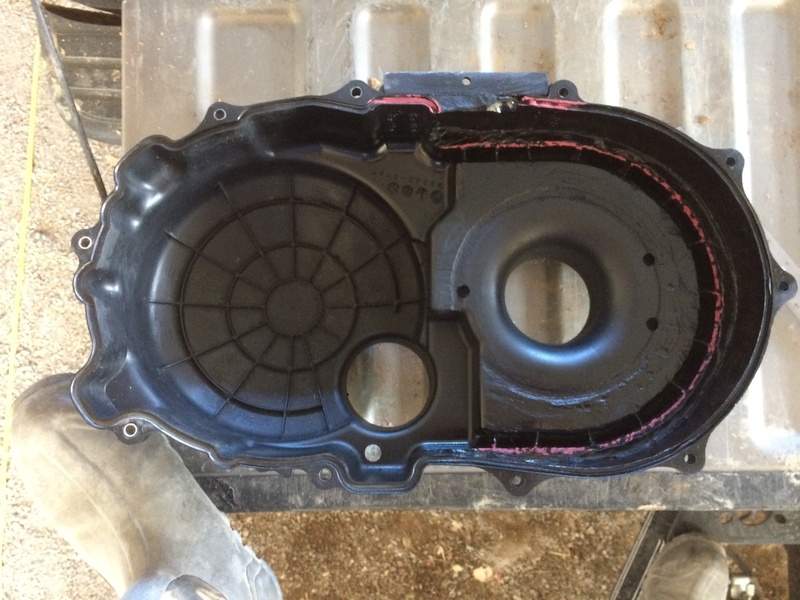 For the few guys out there like me, dying for more bottom end than can be achieved, due to larger tires and the cover limition, the answer is possible and inexpensive! 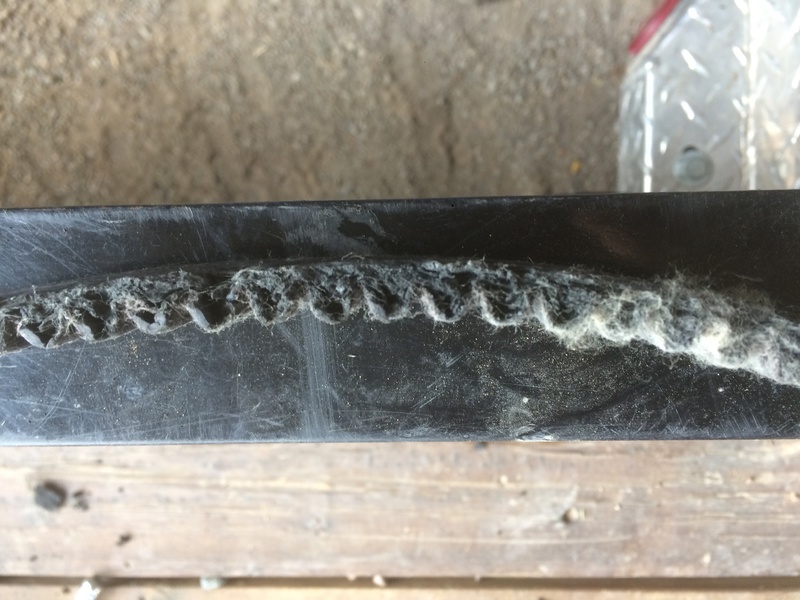 This post won’t be so much about what products I used, as I believe some will know of something better, or have plastic welding capabilities, but the focus will be more on how I got there. I’ll tell what I did use but, even my idea could be improved upon. Its nothing more than redneck engineering! All I can tell you is that the effort is so worth it! Remember when you first installed your machined sheeve and thought WOW! Then maybe you added bigger tires, like me and lost some of the improvement? Well it’s definately Wow again! So, here we go! Remove both half’s and bolt them back together. On the outside cover, I made marks from the center where they join to 1 3/4“ all the way around, from where the cover makes a big jog, top to bottom, then use a flexible straight edge (piece of cardboard) to make a straight line around. This will cut the cover just shy of the fins inside and will give ample room to the side of the exposed belt inside. The outer edge of the exposed belt is 1 3/16” from the center of where the two halves join. On the back cover, I don’t remember where I marked it. I just made sure I had a nice shelf to get epoxy on. I used a dremel and a cut off wheel. It worked, but melted as much as it cut (tedious) for the cross cut at the top I got it started but used a hack saw blade to finish. That worked clean and efficiently. I’d recommend somthing like that for the whole process. Deburr all edges with somthing like a 1/2 round file! Use a heat gun at the bottom to bend the whole thing down. Try to keep the bend as close to the corner of the jog as you can. Don’t get to close, be patient and warm it up slowly. Don’t want to make it brittle or melt it! Apply gentle steady pressure until you feel it relax where you want it! Slightly ahead of where the cover jogs the belt is beginning to head back toward the primary so clearance is no longer an issue! I didn’t want to do this and still wish I had more, so I went with 3/8 tubing in the photo to try and create an even radius all the way around while heating and reshaping. The idea was good, but the tubing proved to flexible, so I ended up using short pieces of wood dowel taped on and this worked quite well! 1/4 to 5/16 dowel will likely create enough clearance. I’ve got a lot of belt exposed and still have way more clearance than stock! Clean the surface real well with acetone or alcohol, then dry it really well with the heat gun. Most epoxy products stick to the first thing they touch, so if it’s moisture, that’s what it sticks to and not the plastic! I found some 3/8 round weather stripping to fill the gap. I glued it in place, then used a product called SUPER FAST that sets up (super fast) and made little spot welds every 2-3 inches working from the bottom towards the top. This product is not available to the general public. I use it to rebuild broken horse feet, so check around and find something else. Another thought is to leave the dowel spacers in while you apply the epoxy between them. This will keep it in a perfect radius. Let it cure, then pull the dowels and finish up! For the rest I used PC11. I’ve had great luck all my life, with it, or anything JB Weld. It bonds and doesn’t let go and is very strong. In hind sight, I’d use a high heat type of either product. I looked into it, but I could only find it in small quantities, and the PC11 came in big containers, enough to do the whole job. I’m not concerned about it breaking! A light layer of epoxy could be laid down and then fiberglass and then more epoxy if it’s a concern! After it’s cured you can dig out the weather strip from the inside and fill it in as well. 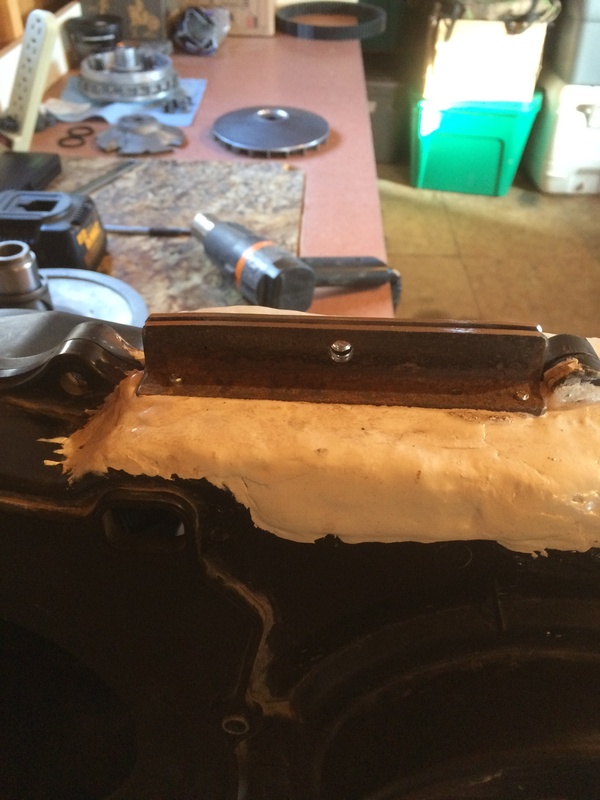 Use a dremmel and cut off wheel, as well as a rotozip bit inside, after curing, to clean it up nice and square! If you don’t you may risk contact in this area with the side of the exposed belt. I learned the hard way! I bridged the gap at the top with thin aluminum flat stock, cut on a band saw to fit, and riveted it in place. Next add your PC11 layer to get the height level from one side to the other. Next add 3/4 angle iron. Drill a hole through the center before putting it on, a bit larger than a metric bolt the same size as the other cover bolts. Weld a nut on the back side for ease of installation and disassembly. Leave an 1/8 inch gap between the two angle pieces! I riveted my angle on as well but if I did it again, I’d drill a bunch of holes in the bottom and just let the epoxy push up though the holes for extra strength. Push it down in place and keep it upright through the curing process or it will slowly shift out of place, and leave you cutting it back off. After it’s cured add more PC11 on top of the bottom portion of the angle iron for strength. Trust me, it’s not going to break off! With all the PC11 application, it’s thick sticky stuff, so let it set for 15 minutes and then with a thin rubber glove on you can mold it around, and smear it pretty smooth! 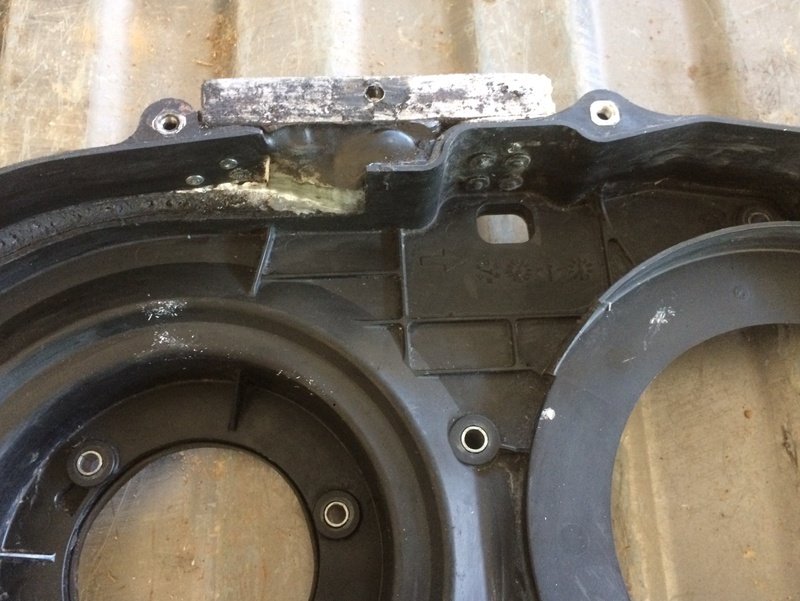 Be sure the epoxy around the bolt holes isn’t so high as to interfere with the bolt, socket, or extension! Worst case, you have to grind a bit off if that happens! 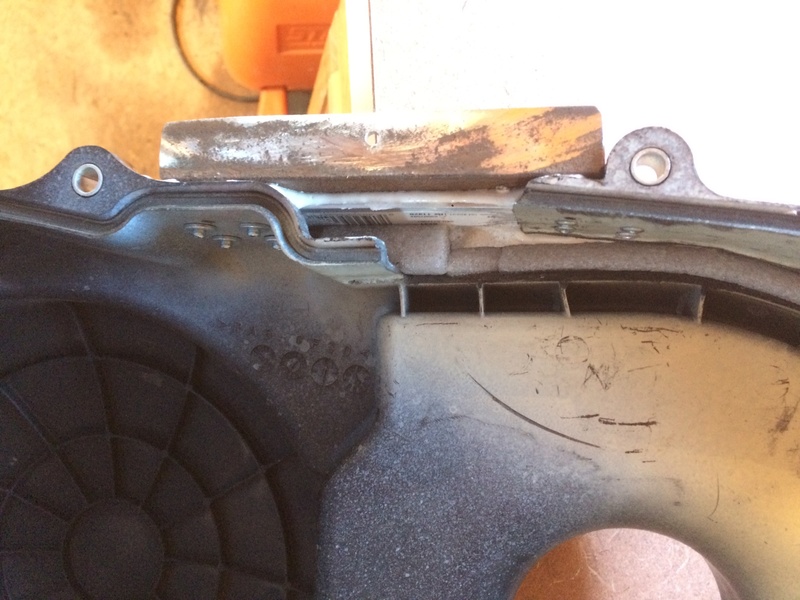 I used 1/4 by 3/4 flat weather stripping with an adhesive back and stuck it to the angle iron, on the back half and drilled a hole through it for the bolt. When it’s tight it’s really compressed. Not guaranteeing water won’t seep in, but its almost as high as the seat. I personally won’t ever be that deep! 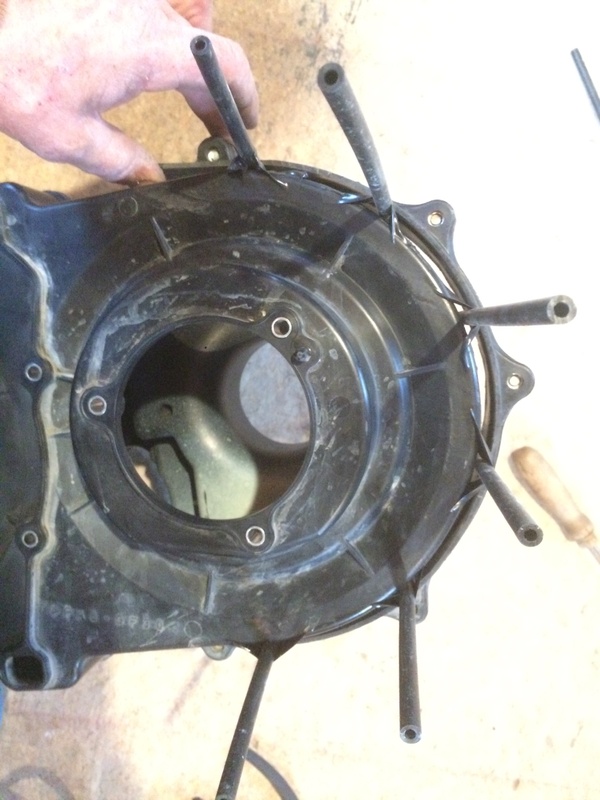 The rest goes together as original and is sealed with the rubber gasket! Taking it apart and putting it back together is just like original. Fits like a glove! The only part of the seal that is different, is that 1 3/4” at the top and I think it would need to be submerged along time for even A small amount of water to seep in. Who really cares with a greaseless sheeve. If I see any water in my clear tubing running from the drain back to my hitch, I’ll pull the plug!  You will notice in one of the finished photos a red line inside representing the former clearance, as well as red lines showing how much of the original gasket is in play and a narrow strip sealed by the new weather stripping! Another thing you’ll notice, is in some of the photos, the little L shaped part at the top is present, and in my final photos it’s cut out. I had a setback in that area originally. I put 10 miles on it and blew a belt. 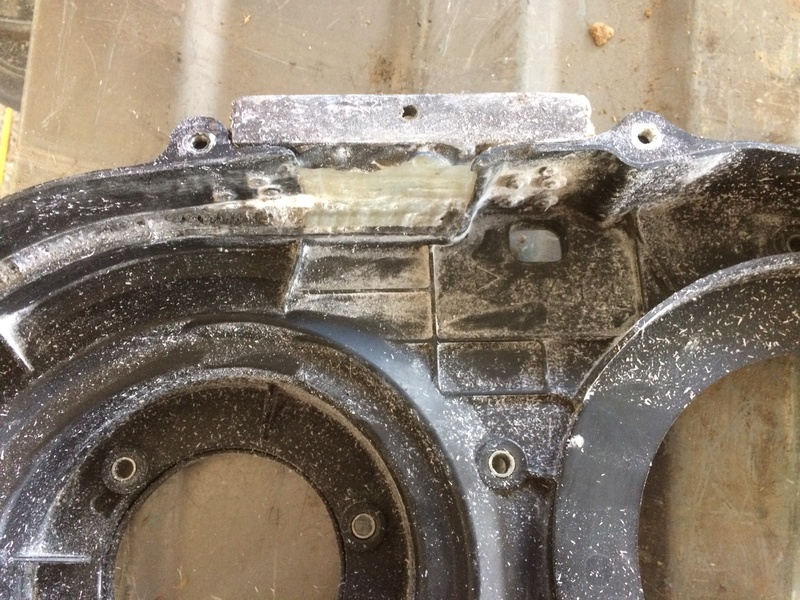 Turns out that on my 1st attempt, I had filled in that area, between the L shaped jog and the angle iron with some epoxy and had a little of it pertuding out and actually contacted with the side of the exposed belt. I was using a rotozip bit to cut it out a little and came to the realization that it offers nothing at this point so I then removed the whole L shaped jog. Do yourself a favor and just cut that out in the beginning! 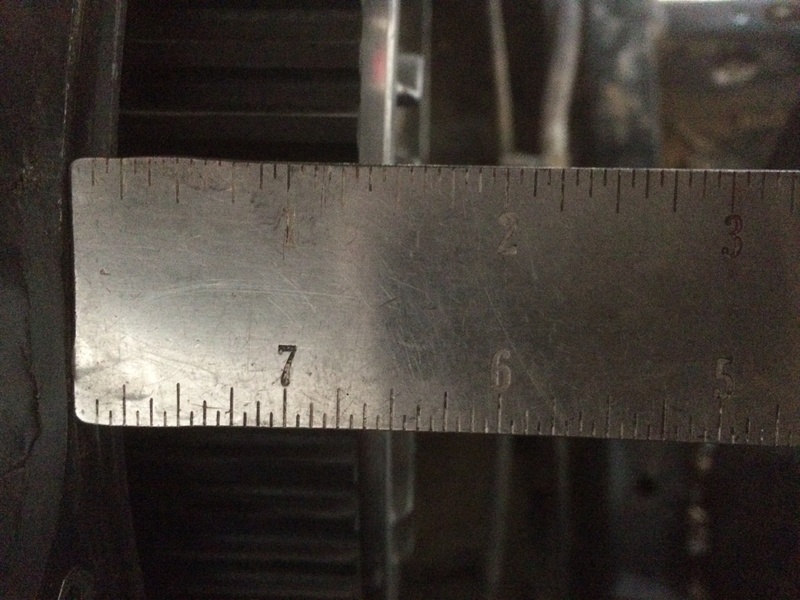 The 2nd photo of the belt installed and the ruler is with 1.5mm of shim, with 5mm of belt exposed and 13mm of clearance. Mine isnt perfect, and it’s only 8mm clearance at the bottom but thats still 3mm more than stock. 5mm of exposed belt would be right against the cover prior to the mod! I found that stock there was around 5 to 5.5 millimeters of clearance between the outer edge of the secondary and the inside of the cover. 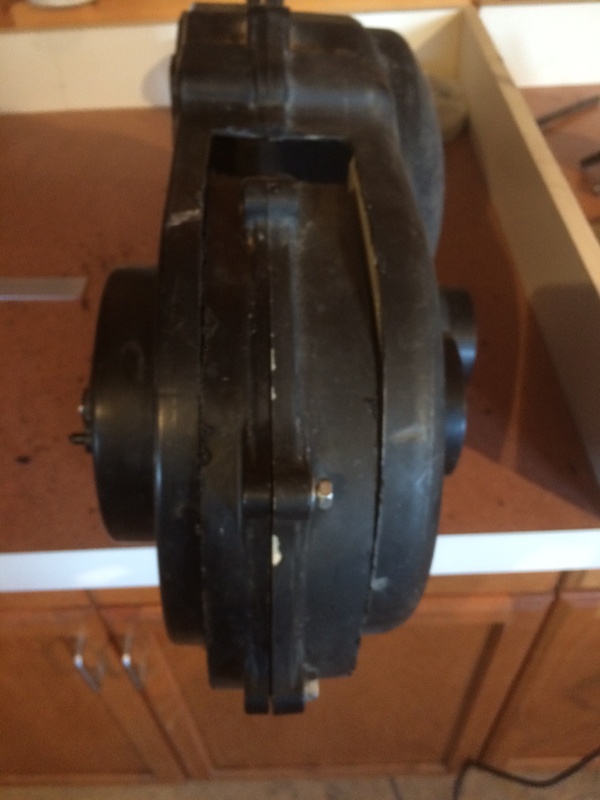 I installed the secondary and belt and tightened up the secondary sheeve with the belt on the collar of the primary shaft and there was 8.5mm of belt exposed. I still had 8mm of clearance. There’s just no way to get contact now! I then installed the Hunterworks sheeve along with 2.5mm of shim. ( one gets curious when doing these things) I got 6 to 6.5 mm of exposure. I say this because you can tighten the secondary by spinning by hand, all you want and measure it, and then actually run it with the tires under load and you’ll get a bit more exposure. With that said, consider all the numbers I give as “approximately”! Now, 2.5mm? Yes I ran it for 20 easy miles. I had to feel it! It’s a tractor with 28s and probably would top out at 42MPH and felt like it took off as easy in high as it did low before. 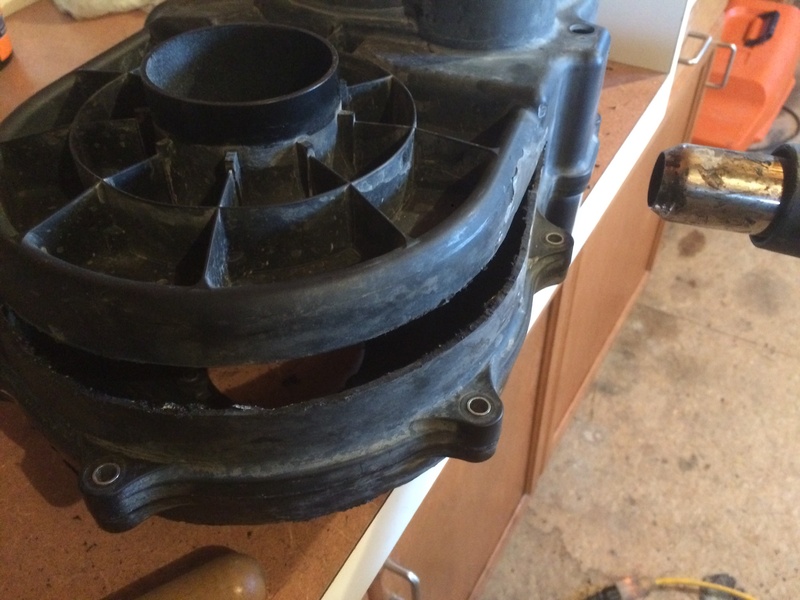 It worked and nothing came apart but some of the cam plate was on tapered spline at the end of the output shaft. 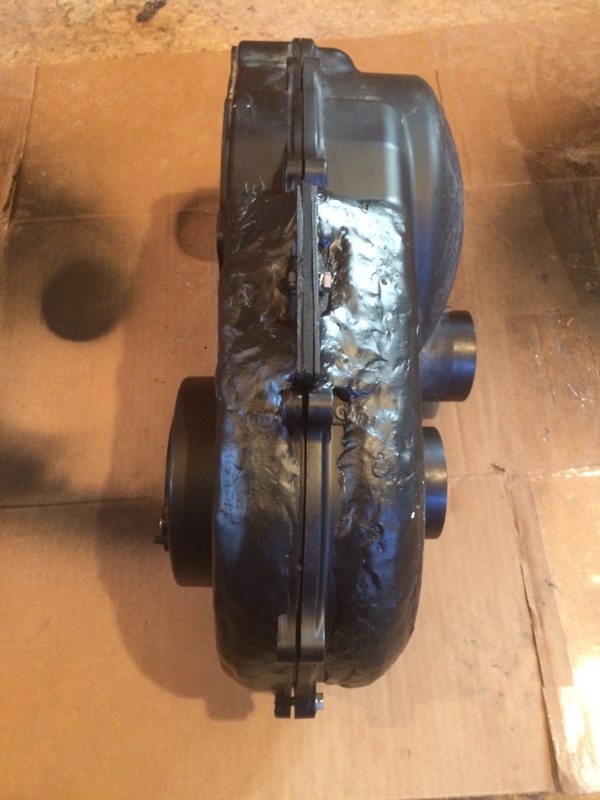 It required no spacer and after torquing there was no spline marks on the back of the nut. ENTER AT YOUR OWN RISK! And really of course that goes for all of this, but the grizzly guys have been shimming up to 2.28mm along time with the same engine and CVT. If your curious, 2.5mm created a 3.35:1 ratio. If my research is correct stock was 2.5:1. Possibly if your lucky enough to have an output shaft like Papaskeeta’s, that’s a little longer, you may do that safely, but you still have to consider that based on my exposure tests the belt is 1.5 to 2mm off the collar with 2.5mm shim, and with big tire load, some belt wear etc..... what happens when the inner side of the belt starts touching the collar? It’s already turning a tighter radius since it’s lower in the primary and likely to shorten belt life. I can only imagine 30” mud tire guys experimenting with that risk! 2mm was really close to being 100% on spline with the cam plate. For me, still to low geared, still a little risky. I’m 100% on spline with up to 1.75mm. Everyone’s will likely be a bit different! 1.5mm is the right combo for me and I feel safe, but belt life will yet to be determined, and if I can get 1500 to 2000 miles that’s good enough for me. I’ll go in there at minimum once a year to check and service. I was only getting 1600 to 1800 before anyway due to pushing the limits and hitting the cover. That was acceptable for me, but this is just risk worth the reward for me. I finally have it performing to my expectations with tire size and riding style! I drove it quite a bit like this with 14gr weights and purple, 16gr and purple, and then 14gr and green. 28” new black water evos. Basically I’m right back to what it was with stock tires and the Hunterworks kit, maybe a hair more bottom end. I’m settling in on 14gr and green. I like the back shifting a bit more with green, and while I’d prefer as a crawler or just trail rider using 16gr for less noise of engine RPM, I do get into the hill climbing some, and there’s no comparison between 14 and 16. 16s it climbs and never stalls but its literally foot to the floor on the real steep long stuff. 14s, your not to the floor and if you want more you push it down and it spins all four. It gives the driver a lot more confidence it that situation! Weights and springs change nothing for crawling, only machined sheeves and shims do that! I plan to have a look in there at 1000 miles and measure the belt for wear. If I have any failures I’ll post it in here, as well as if it’s all humming along just fine! We’ll see about this Yamaha reliability now, LOL. 3800 miles so far 2 bad axle boots, 2 blown belts ( my fault) so virtually trouble free!!! 120 miles on this new set up with modded cover. After 40 miles of easy belt break in. All hard hot roding, rock crawling, deep crusty snow, or big hill climb riding. No trouble yet! It’s amazing to me to be able to take a 708 single, have it in a heavy side by side instead of a four wheeler, add 2 size bigger tires and have it running around performing like this! CRAZY! Thanks Hunterworks and TINKEN! I could talk on and on about how smooth it is now and how it performs but I’ll try not to bore you! Some things people want to know: all info is in my signature and with that I got it up to between 42-44 MPH In low. I can hit 50 here and there but it mostly bounces around at 47-48MPH in high. This is a full tank, me 170lbs, and about 70lbs of gear in the back. Split window open, level to slightly down hill. That’s on the speedo, don’t know what that calculates to. Pretty nice to jump up 2 tire sizes, have way more bottom end than stock and top out the same speed as stock! Interesting results, consider all approximates, not saying this is exact! I rounded all exposure numbers, and estimated most ratios by eye. My .5mm shim is actually .45mm and one of my 1mm shims is actually 1.2mm! So if I figured it exact, there would be some inconsistencies, so don’t hang your hat on any of this! I only did this as an avererge to give an idea of where to start and minimize experimentation. Suppose somebody says I love my setup, but you have a size bigger tire! So you subtract 4 to 6 percent for the one size bigger and some weight and you can see how much shim you would need to achieve similar results! You can see on average for every 1/2 mm of shim, you gain 1/2mm of exposure. For every 1/2 mm exposure, you get roughly a 3% more reduction. Now that doesn’t sound like much, but I can tell you it’s easy to feel the difference in how it drives every change of 1/2 mm shim. Hopefully if you choose to do this, maybe this info will save you some messing around! All of my findings were very similar to Ford TruckMans, TINKEN’s and noload’s in the sheeve comparison thread! MassiveOverkill, noload, monksblood and 1 others like this. Wow, you did a great job on this one, I think even Yamaha engineers would appreciate your work! For as smart as the Yamaha engineers are there are a few things that are just plane dumb. This lack of clearance around the clutching is certanly one! Budro your solution is right on the money! Its to bad the factory didnt give us the clearance right from the start! Excellent job! Lj3 I couldn’t agree more, however I think it’s intentional on there part. It’s not because the fit is to tight down in there and they litterally put a big jog in the cover top and bottom to squeeze it down tight. The only thought I could think is the less air space there is maybe the quicker the heat can be pushed out! Just a hunch. Budro your probably right, Yamaha most likely doesnt want us messing around in there. But I just cant leave some things alone. Ditto, sometimes I fail and some smarter than me can say I told you so, but I like the challenge. I don’t think they do want us messing in there. I try to keep some sense about it. 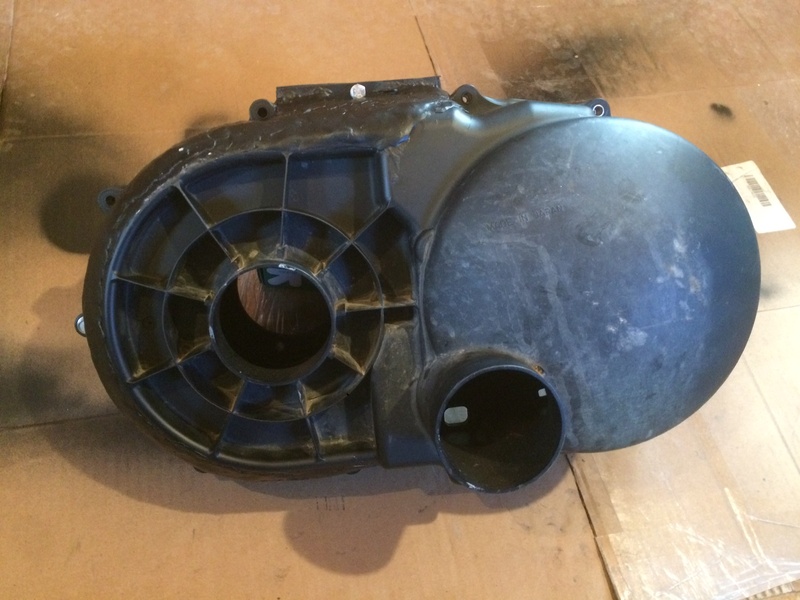 One can create a sheeve ratio low enough to turn 30s in some bad stuff, mean while the rest of the machine isn’t designed to take that so you could really tear it up. I’m doing a detailed update in this thread, for anyone serious about the low ratio quest as I have been! I never dive into anything without considerable research and trying to go about it as intelligently as possible. I’ve have found that trying to draw from the experience of others way ahead of me in CVT knowledge or even those experimenting before me has been difficult, with the exception being one other person on the forum who has also been on the same quest and also done some experimenting beyond the perfectly acceptable and awesome aftermarket sheaves out there! Those with knowledge are usually very brief with explanations typically or give answers you don’t ask for while at the same time not answering your real questions, and some who have experimented as I, have posted videos about it, here and there of their buggy in action after modifying with all looking good but haven’t followed up after it didn’t work, weather on this forum or elsewhere. There is just enough information out there on the internet or various forums to lead one to believe that going forward is possible if you can get around this or that! Still others are not willing to return PMs or emails regarding it! With all that said, I don’t want to falsely lead anyone else to think an unrealistic dream is possible in this quest and while there are small benefits to be had they are realistically very small depending on different variables. Also I am not pointing blame at anyone regarding my quest, I’m perfectly willing of my own accord to wade out in the water and come back and let everyone know how deep and cold it really is! 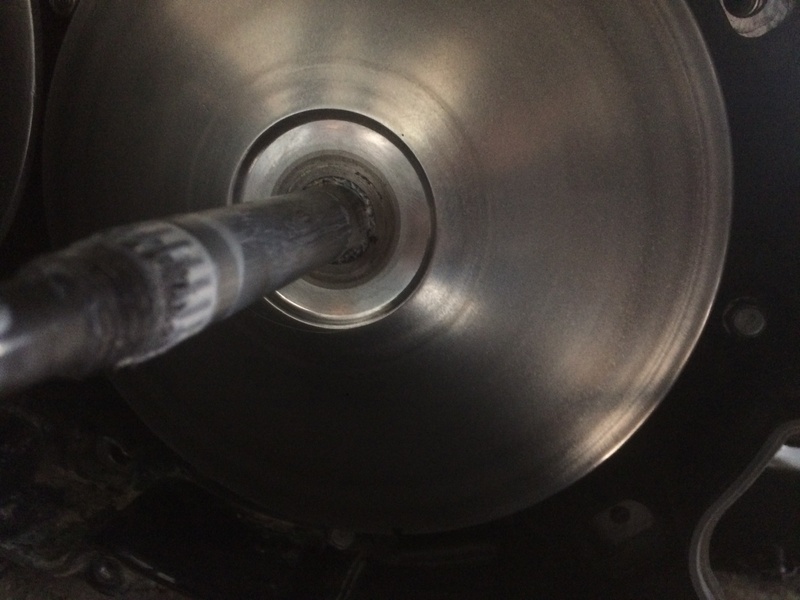 I, have not found any information anywhere, EVER, stating that there is anything other than the CVT cover or the amount of spline on the output shaft limiting a lower ratio and I guess this is absolutely true to a degree. The lower sheave ratio is definitely achievable. 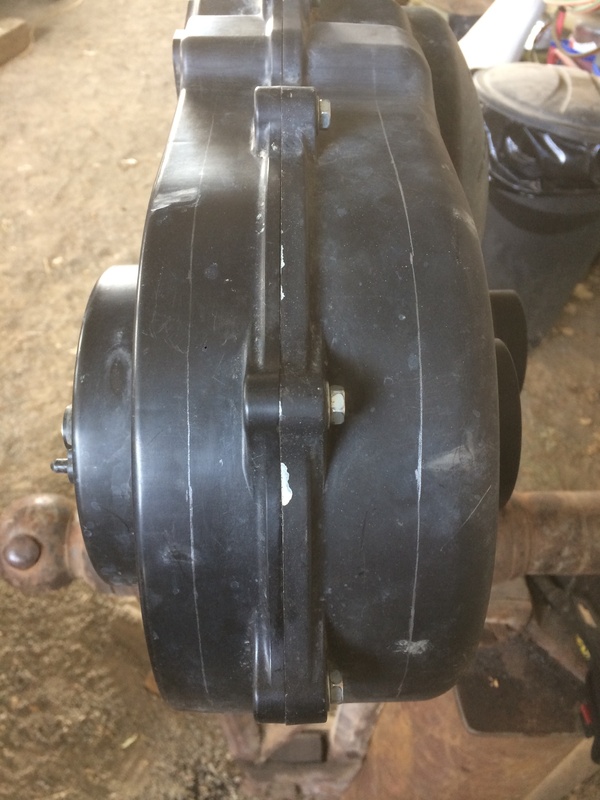 It is well stated that shorter belt life can be expected due to the tighter radius and friction created from being lower in the primary, and having the least amount of belt grip when it’s actually needed the most. Within reason of a certain amount of belt life this is all perfectly acceptable to me! In my original post I stated experimenting with maximum shim on the splines out of curiosity and having a belt failure due to mild rubbing with the cover modification somewhere. 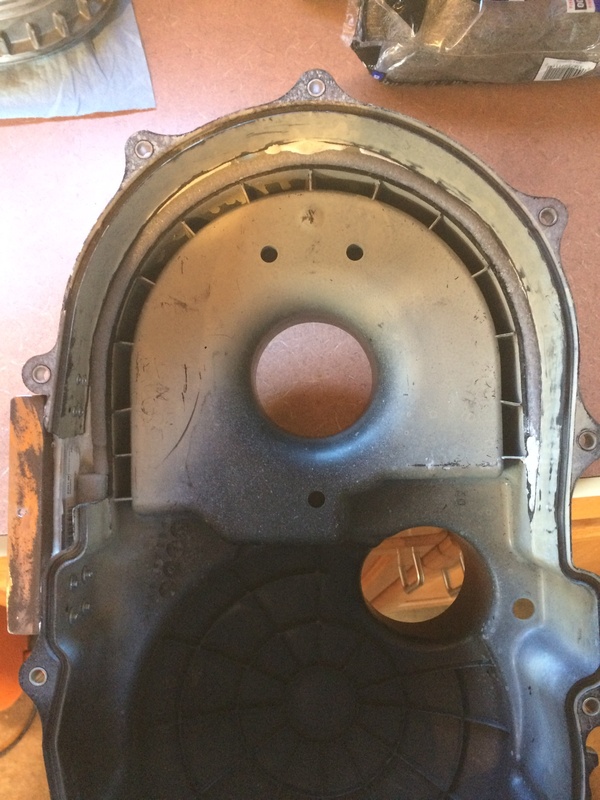 I speculated that, because areas were rubbed in the cover but the belt came apart and slapped around in there and at the time I couldn’t figure it being anything else. Turns out it wasn’t the case and the original cover modification was successful, as it still is. The cover is only the 1st limitation. The second limitation is the rear primary sheave face! I got 10 miles on that belt before chewing it up. That area that is recessed in is the problem, I knew the belt was partially riding down into the recessed area but really didn’t think it would matter so long as it wasn’t touching the collar. 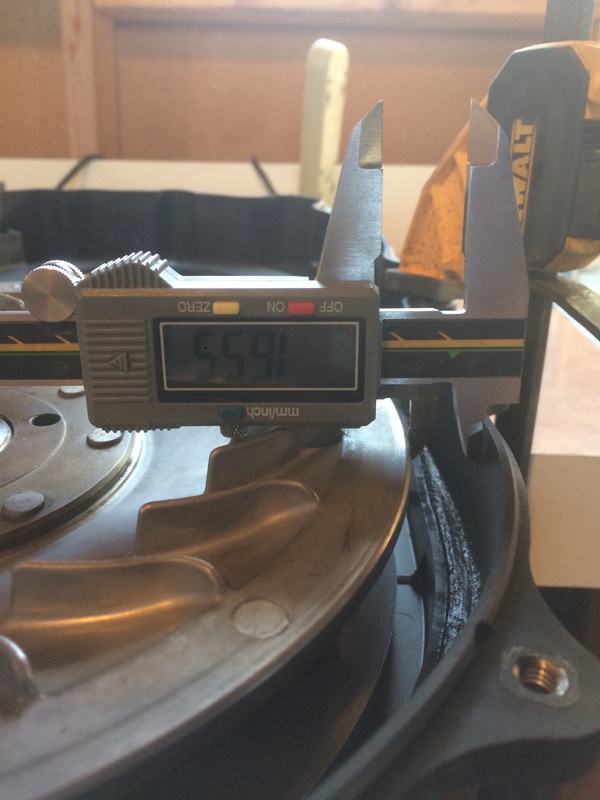 After my 1st test I dropped back to 1.5mm of shim. All went great for 200 miles this time before losing the belt again and when I pulled it apart it was an exact same crime scene as before! The inner edge of the belt remenants were all chewed up again, with a strip of belting actually cut off and wrapped around the collar both times. I know with 100% certainty that no rubbing with the cover is happening, especially regarding the inside edge and the outer, ribbed face of the belt fragments looked perfect both times! Here’s a pic of the belt showing the outside edge of the belt looking normal! Now, here come the variables, IMO. After one discussion with Todd earlier on, I came to realize that I was looking at this belt and where it rides in the primary as static position but in reality under load, it is actually pulled further down in the primary. Obviously the bigger the tires the heavier load on the belt. The the bigger the rock we grunt up over, the deeper and denser the snow, the thicker the mud........ My point is that a modified cover and 1.5 mm of shim will likely work for some using 26” tires or maybe even 27”, especially under normal driving conditions, but there is no need for all that in that situation. I think it would work with 28s if I only drove in slippery mud that wasn’t deep which only decreases load, or putted around normal trails, or rarely went at a speed where the CVT is in its lowest ratio, but again what’s the point of doing it then! I think with 2.5mm of shim and 5mm of inverted exposure at rest, in reality under decent load the belt probably bottomed out on the collar, then with the tighter radius causing more friction and heat and playability the outer sheave face just forces the belt over completely into the recession and eats it alive! Imagine now if your the guy with 30s wanting to turn em in mud! The ratio is possible but unless one can devolope an inner sheave with no recession in it, then your doomed to failure. Even then with the load of tire and conditions coupled with the friction of the tight radius, I don’t see you standing a chance and it will probably still get sucked down against the collar! One thing I’ve been curious about is the fact that TINKEN can get away with so much more. I realize it’s not the same sheave, and there’s probably no shiming and maybe he even designed a different rear primary sheave, but I personally think it’s the heat. He doesn’t run a cover therefore he eliminates contact, but more importantly heat, and therefore no belt playability so it withstands a lot more pressure from the load! When I lost the belt driving only 10 miles, I changed the belt in the field and drove it back 10 miles with 2.5mm shim still in it but without the cover on it and the belt had no damage going back which is partly what made me think it was a cover rubbing issue, but in reality it was a heat issue from the tight radius the belt was turning and the CVT can’t get rid of It fast enough. I’m not sorry I modified my cover, I didn’t have any of this with 28s and .5mm shim, even though there is 1mm of inverted exposure. Hunterworks recommends not using the shim with 28s but I originally missed that in all my reading. I only got cover contact after 1500 miles from belt wear and stretching. Perhaps now I can run a belt 2000-2500 miles in the conditions I drive in. I’m sure I have more heat than guys not running the shim or guys running 27s. I only went with 28s for maximum rock clearance and was never tempted to go larger based on Todd’s opinion of it. When these tires are worn out I’m going to 27s and Eibach springs to get the clearance back, it’s a better solution. That gains me back 4-5% of my gearing and I just lost 6% going from 1.5mm shim to .5mm so I’ll still be close to where I was. I know one person on the forum using .75 with 27s and no issues with this matter. I’m not sure how he’s so lucky regarding the cover contact. 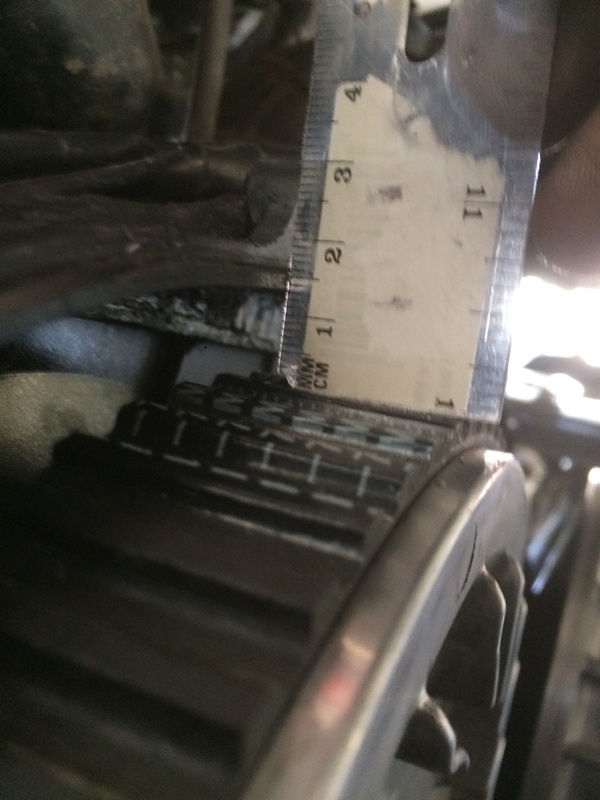 He also ran 1.0mm shim a whole season with 26s and didn’t have any issue other than a mild cover rub. This makes me think that with some 27s preferably lighter weight, I’ll probably be able to use 1mm of shim and be lower geared by a scoosh than I was with 28s and 1.5 shim. That’s yet to be determined however! After all this, IMO, if your on the fence about tire size and as boldly stated by Hunterworks don’t go over 28s, my opinion is don’t go over 27s!!! The 3 belts I’ve lost throughout all this would pretty much pay for eibach springs to get the needed clearance, not to mention all the time. I will say the learning is fun and I’ve actually enjoyed the whole process! MassiveOverkill and noload like this. I guess my last photo timed out before I submitted it which show the marker testing! Wow ! You've got a lot of time and effort into this! And cost! Are you using OEM belts? If I may; here's some more mud in the water. 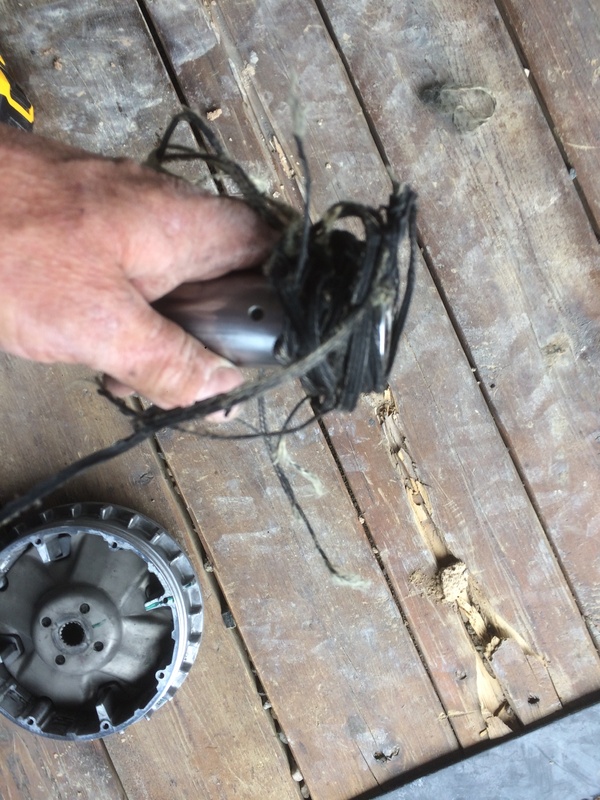 I have run the 1mm and the .75 without issue, and cousins machine with the 1.5mm melted the belt to the cover with 26" Ripsaws,but...one big difference........secondary springs.......I never bought into the idea of running a soft spring and light weights. He has purple spring and 14's. He also had belt/cover clearance at rest as it sounds like yours did, but, (here comes the speculation part) if under hard acceleration/load the tension of the belt overcomes the spring pressure in the secondary and starts to drop in the sheave,then the belt will get "slack" on the loose side, light springs will also diminish the grip/friction to the sheave and build a bunch of heat if there is even the slightest slipping. I understand what your saying about the belt"pulling down" into the primary, but I think that would be minimal,(belt material would have to compress or the sheave spread) I think theres a much better chance of it slacking because of light secondary spring. I suspect the slacking is whats allowing it to bang into the cover. Mine has the gold spring in it and that might be the reason its been trouble free. I also run 18 rollers as I "feel" it pulls better through the midrange with the 18"s over the 16's, and next time I take it apart I might put the OEM spring back in it. I alternate between 26" and 27" tires. I did change out the 1mm for the .75 because of a slight rub, but that could have been because my belt was worn right to replace specs. I would like to get it back in there, it sure helped in high altitude. I would be very curious to see how yours would run with .75, factory spring and 16's with those 28" on it. 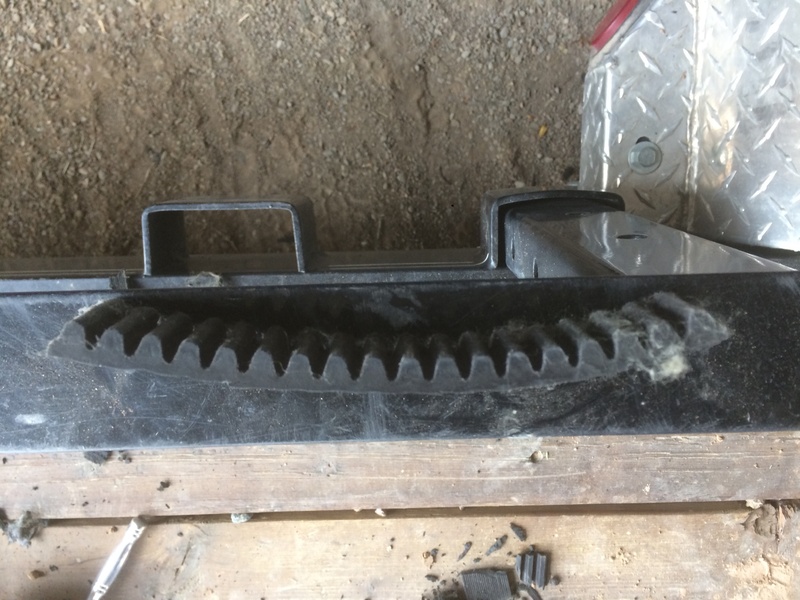 I ran the original belt after installing the Hunterworks sheave at 1500 miles. I probably should have changed it but it was still within spec. At 1650 I added the 28s, at 1950 it hit the cover mildly when I was in some deep snow. No doubt the 28s attributed! I changed to a gates and ran trouble free for another 1550 miles. Off and on in high load situations I would smell the belt throughout that time. I finally hit the cover bad in deep snow and disintegrated it! All this time I ran the .5mm shim with 28s and missed reading that you shouldn’t! I was stuck with new 28s and couldn’t imagine going backwards in ratio due to my typical driving environment so I modified the cover. That’s when I got brave and thought I’d make it a beast and I did. It was awesome while it lasted. The last 2 belts were Hunterworks and I want to be very clear that the destruction was in no way the belts fault. 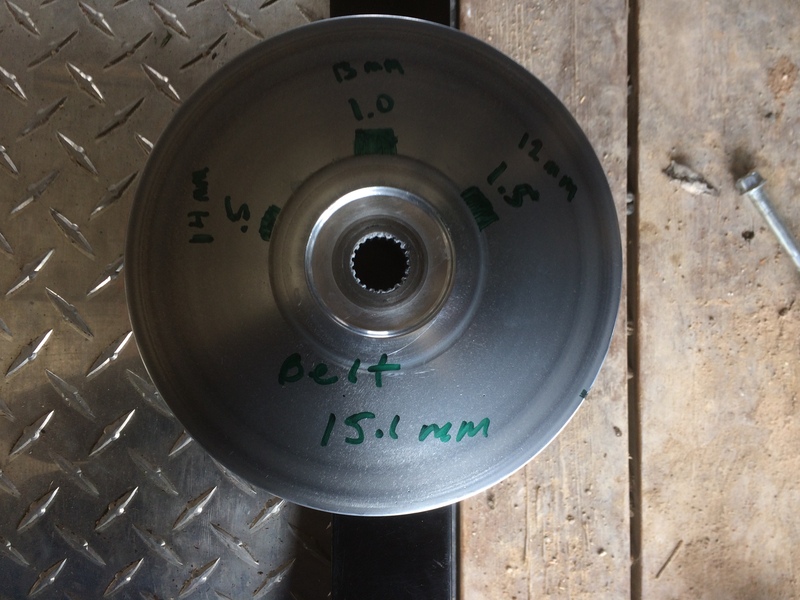 Todd told me this morning if your not using the OEM sheave to only use the OEM belt. That’s what I had already put back in it. I also went back to .5 shim and 16 gram but in the mix of all this I changed to a green spring and put 2 slippery washers on both ends. The last time I ran 16s was with a purple spring and washers only on the bottom side. The added washers should make it even a bit stiffer but not like a gold. I’m not opposed to trying what your saying, I think you may be on to something and it’s making sense to me. There’s definitely something different with you not hitting the cover like you should and it’s not just tire size! This may all sound ridiculous to the more experienced and I know from what they say it’s all gotta work in harmony but your getting by with stuff that’s not supposed to be and I can’t help but want to investigate. Enquiring minds want to know. My problem right now is turkey season opens in a couple weeks and for the next month after that I’ve got to have this thing not leaving me walking! We have to get back in some off grid places and there’s usually some snow places to bust through, especially on a year like this. So I’m doing what I know works. After that I’ll probably give that a whirl! I’m pretty sure 1.5 shim and 28s will never be reliable regardless but I also think if you’ve already got by with 1.0mm then there’s a good possibility that if the cover is out of the way then that may work with 27s and it would overall be a bit lower than 28s and 1.5 and that was the bomb! Todd also told me today not to run more than .5 with any of their products and I believe him, however I don’t know if they have played with anything you are suggesting and something is definitely different with yours! I’m not saying they don’t know, I trust them as the leader and experts but if no one will step up and literally say we did this, and this happened! Or you may try that but when we did this was the result, then that leaves me thinking maybe there is a combo of the whole package including tire size that works well in a lower ratio! I’m not afraid of failure, failure is progress eventually. I don’t want to be a CVT expert or get into the business but the “experts” didn’t get where they are by not experimenting and failing either. I find it interesting that I only know of four people crazy about this quest, one is a CVT expert in IMO and has the experience knowledge and skill to achieve his goal and the other 3 live In Colorado. I think that says a lot about elevation and what it does to performance! One other thing I like right now about your speculation is that every time the belt hits the cover it’s at the bottom right where the slack would be produced as a result of a spring to light and due to load weather thorough tire size or conditions or both pulling the belt down into the secondary, creating a bit of slack and or just pulling down in the primary. It really makes sense to me that the tighter the belt the less slack hitting the bottom. It’s never at the top! Also how do I know that I’m not getting a bit of slip creating heat and stretching because the spring is to light. There’s only one way to find out and that is to experiment! I’m about ready to go without a cover. We get in snow and we get muddy but we’re not deep mudders at all and I don’t ever find it that bad down in there when I wash it! I’ve already proven to myself that one can get away with a lot more when there is no heat!